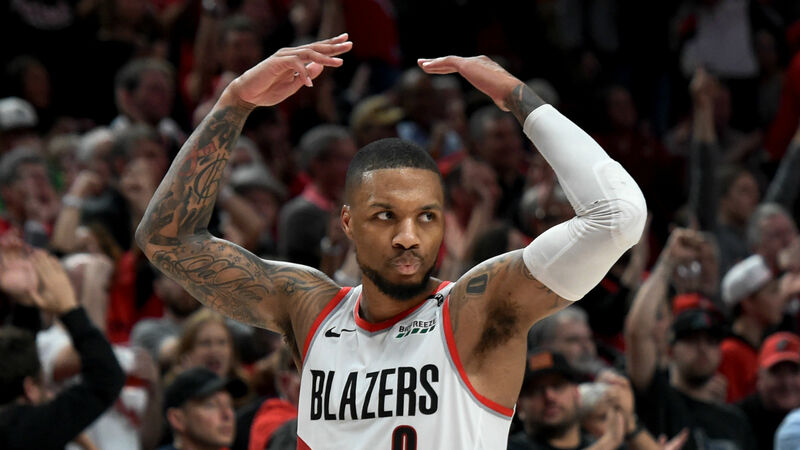 The Portland Trail Blazers may have taken a 2-0 series lead over the Oklahoma City Thunder but Damian Lillard knows they have to perform on the road if they want to progress in the playoffs. A 114-94 victory at Moda Center backed up the opening game win for the Trail Blazers, with Lillard contributing 29 points, four rebounds and six assists. Only CJ McCollum returned better stats for Portland as the West Conference's third seeds gained the momentum in their first-round tie. However, Lillard called for caution given they have not made it through to the conference semi-finals since 2016. "I've had experience of being 2-0 before," he told reporters. "I'm happy about it but I really don't care. "I know how quickly things can change. I know that a series doesn't start until you win a game on the road. And I also know how capable their team is. "We've just got to maintain our focus, stay sharp and understand that how we've played in the first game and second game is not going to be good enough in the third game, especially on their home floor. "We've just got to keep our heads down and keep working." Portland are now five games unbeaten after finishing the regular season on a high, and Lillard credited the work done in training for their impressive run. "It's the preparation," he added. "When you're in the right place and doing the right things that you prepare for, a lot of times the ball ends up in your hands. "We've been really sharp in our preparation and in going out there and executing it. "We've been sharp and a lot of things have come for us in a positive way because of that."